20th Century 902. 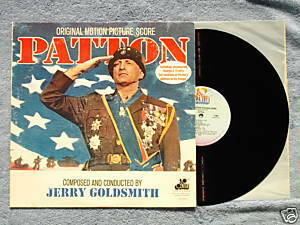 Patton 1970 LP soundtrack from Francis Ford Coppola's film includes George C. Scott's uncensored address to the troops. Music composed and conducted by Jerry Goldsmith. Karl Malden as General Omar N Bradley. Liner notes by Franklin J Schaffner. Vinyl is VG/VG; cover is VG with some ring wear.